You only need to remove the palmrest/touchpad assembly, but one of the screws holding the palmrest/touchpad assembly is hiding under the DVD drive. So first take out the DVD, then remove the palmrest. Once the palmrest/touchpad assembly is removed, the cable connnecting keyboard to mother board is visible. Disconnect the wide cable from the connector, polish the exposed metal end and you fix it. This is not a solution for everyone! as this hasn’t worked for all….Lenovo team is working on it…..I will post once there is a final solution from lenovo officially. I’ve been reading through this topic, every single post and it’s kind of unfortunate to see that this problem seems to occur only with this model of the ThinkPad Edge, and I for one do own this model.. I didn’t want to sit around and do nothing, and I also didn’t want to call up tech support having to end up sending in my ThinkPad and having it replace only to find out this problem will persist. From what i’ve experimented around with, I found out putting pressure on a certain spot of the palm rest will result in the keyboards having this obnoxoius problem! and btw, i did try out someone’s solution about using an eraser to erase the metal tip, that didn’t really work out for me. I for one, did not have this problem until about 6 or 8 months after owning this ThinkPad Edge model. 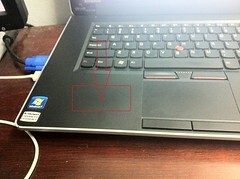 When the screws holding the Palm Rest/Touchpad are screwed in default, as in they’re securely tight, putting pressure on that specific spot(The RED rectangle with the arrow) of the palm rest result in a direct outcome of the “E D C” keyboard problem. This is how i basically came to this conclusion. First i tired the eraser trick, and to my surprise it worked! but then couple of weeks passed the problem came back, so I repeated the eraser trick. Before i got to unhooking the keyboard wire(Palm rest/Touchpad already off) I accidently pressed E while the laptop was on and i noticed right away that the Volume didn’t go up, which would happen if I pressed E with the problem occuring. I was shocked, and so i tested this out even more. I left the touchpad completely off the laptop and typed a sentence testing all the “infected keys”. They worked normally! This meant the eraser didn’t really do the trick, it had to be a result of the touchpad with certain contact with the mother board. I securely screwed back on the palm rest/touchpad and typed the same sentence again, the problem occured. So this became obvious, the problem lies in that area. I loosened up the screws and to my surprise, the keyboard was functioning normally, i left my laptop in this condition for about 2 weeks until the problem popped up. So i repeated the process from before, took off the palm rest/touchpad, then put it back on without the screws in, and put the screws in loosely. THe problem went away, but came back quite fast this time; however during the times the problem wasn’t occuring, I typed regularly, with my palm on the palm rest and my fingers on the keys. 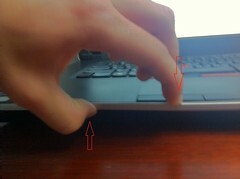 I noticed when i put pressure on the left palm, where the Red Rectangle is located in picture, the problem popped up. Earlier today, out of no where, i just did this with my palmrest screwed in securely and found out the problem didn’t occur when i lifted that certain part of the palm rest with my thumb…. so from reading all this you guys can come to your own conclusion. I hope that what I found can help in solving this very OBNOXIOUS problem. WHen i first got this ThinkPad, I knew this was the laptop for me, but when this problem started to happen, i became quite disappointed. I am t yping this right now on this laptop, without the palmrest screwed it, but on top of it’s default location. Maybe that can help you guys in your fix. Sorry if my pictures were not very descriptive or my explanation, i tired my best!